Continuing my series of posts, as one of my local TV stations shows every Star Wars movie in order, every Saturday, for the next six weeks leading up to the release of Star Wars, Episode VII, The Force Awakens, here is my response to and thoughts on Star Wars, Episode IV A New Hope. 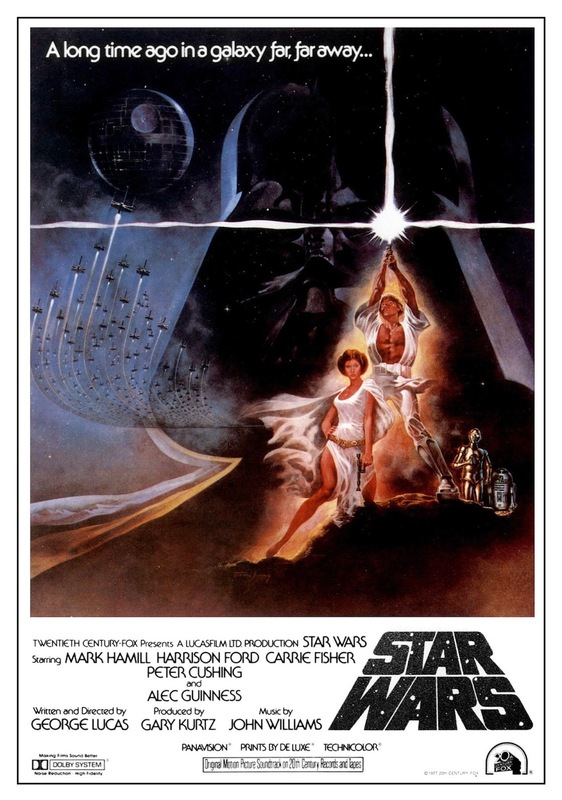 I'm from a generation that have seen and remember the original theatrical release of Star Wars (before it was sub titled 'A New Hope'). The version I watched this week was a Special Edition release, remastered, with extra digital enhancements and scenes. For the most part the extra digital enhancements are an improvement. There are a few misses but I'll get into that later. As a Star Wars fan I'm one of those who would like to own the original theatrical releases of the original trilogy just because, that's what I experienced first not because I think George Lucas' tinkering ruined the films. Plus it would be nice to have them for comparison with the enhanced versions. I sure hope Disney includes the original versions as an extra on any future home video releases. At this point it has been a few days between watching the movie and writing this post so if my memory is a bit fuzzy that's why. I do recall that, as I was watching what is essentially the first Star Wars movie ever to come into existence despite the episode numbering, it occurred to me that this movie has slightly more adult leanings than the prequels. By that I mean the body count is clearly one of the highest of the series with the destruction of Alderan, a massacre of a Jawa clan, the death of quite a few Storm troopers and Rebels on the Blockade runner as well as several Rebel pilots in the final battle and, of course, everyone on the Death Star. Most gruesome though, I feel, was showing the actual skeletons of Luke's Aunt and Uncle. I'm not saying the other films don't have their gruesome 'adult' moments too but I do feel the rest of the series does play down some of the violence as George Lucas begins to realize kids are a big part of the films target audience, driving up the toy sales. In the prequels we see the destruction of robot armies more than actual living beings and don't really get to anything as near as gruesome looking as the death of Owen and Beru Lars until Anakin starts losing limbs in Episode III. Of all the films, A New Hope, in my opinion has the strongest, most complete story. It doesn't contain too many scenes that are heavy with exposition and has none of the boring political game playing of the prequels. It has basically one scene explaining how the Empire is structured politically, the iconic scene where Darth Vader's belief in the force is challenged, and that's it. Everything else is about our heroes trying to outwit the Empire before their base is destroyed. Simple. It's pretty much the space western movie that George Lucas envisioned. Within that it had an East meets West kind of flavor with the wild west mixing in with the more philosophical/religious ideas of various Asian countries. It also didn't mix the ideas in such an obvious way that it borders on relying upon racial stereotypes as much as the prequels do. Another highlight is that all of the principle characters (and the actors cast in the roles) are very strong and clearly defined. So much so that people are looking forward to their return in Episode VII. I must admit I wasn't a big fan of Luke or Obi-Wan, even if they had light sabers - which no one had ever heard of until this film. Han and Chewie had my full attention. I also really enjoyed Princess Leia's strength and total disdain for Han. Between the three of them they have many of the best lines and scenes in the film. What I did take more notice of this time around is that Ben speaks Wookie, or at least understands Chewie almost as well as Han. Before Ben even meets Han he begins his negotiations by speaking to Chewie, telling Luke that 'Chewbacca is first mate on a ship that might suit their needs'. It stands out to me because you rarely see anyone other than Han speaking with Chewie in a way that suggests they actually understand what he is saying. Another moment that stood out was that C3PO has no memory of having previously lived on Tatooine or having worked for Uncle Owen (as seen in Episode II). You can say he may have had his memory erased but I don't buy it. Not with standing, C3PO and R2D2 are some of the oldest, still functioning robots in the entire series- must be a bit of dementia setting in? Maybe Owen has a touch of dementia by this point too as he doesn't seem to recognize a droid he previously owned and is repurchasing from the Jawas. I could probably go on bouncing around this whole film mentioning things that I liked or didn't like so I'll finish with another highlight of Episode IV before listing a few other things worth mentioning. The relationship between Darth Vader and Grand Moff Tarkin. How good was it that Darth Vader appeared to be subservient to no one and there appeared to be mutual respect between him and Tarkin? Apparently Darth Vader wasn't all that remains of the Jedi. Sure we know there is Obi Wan Kenobi but Tarkin didn't. Yet Tarkin seems completely unaware that the Emperor is a Jedi too? Hmmm... well before we knew there was an 'Emperor' and that he was a 'Dark Lord' there was Vader and Tarkin. Together they ruled the Empire and it was glorious to watch. The enhanced effect of the Death Star being destroyed is one of the highlights of the special edition version. The original explosion was tiny, off center and did not really feel worthy of the size the Death Star was meant to be. The digital Dewbacks added to the Stormtrooper desert search scene could have been great but they looked hokey and obviously CGI. Largely because the Stormtroopers riding them lurched around like they'd never ridden a Dewback before. Most experienced horse riders move with the animal and don't flap around against them. I imagine it's the same for experienced Dewback riders. I liked all the extra stuff, digitally added to Mos Eisley but it seemed like nearly every scene with new stuff had a comedic moment embeded into it that was more distracting than funny. Although I applaud them for trying to incorporate the originally shot but unused scene of Jabba the Hutt confronting Han, it doesn't really add anything that advances the plot and Han's walk over Jabba's tail looks awful. Not even the addition of Boba Fett at the end of the scene saves it. In this version of the film it's pretty ambiguous as to whether Han or Greedo shoots first. I've seen a version where it's clear Greedo shoots first and misses so badly from such a close range it makes Stormtroopers look like marksmen. In this version it looks like Han is setting up to shoot first, Greedo has the exact same idea and they shoot at about the same time. You can't really tell with all the smoke from the blaster fire... and I'm fine with that. This film we get a nice explanation of what the force is from Ben. He makes it sound like anyone has the potential to be a Jedi - even those with a midichlorian deficiency. The Force is an energy field not a biological predisposition. At least it was until Episode I came into being. I think that's all I wanted to mention. The original film, in my opinion is still the best. Episode V is a very close second only because it isn't a complete story. Star Wars didn't really need a sequel but we're all glad that they decided to continue the story. That said, if you only ever see one Star Wars film. Episode IV is the one I would recommend.